One of the most significant educational forces in mid-19th century America was the Methodist Episcopal Church. Its publishing enterprises were instrumental in promoting theological literacy in the new nation. Many of the men who came to the ministry had not been fortunate enough to receive formal education. Seminary attendance was out of the question for the circuit riders who were spreading Methodism. How could the church equip its preachers with the theological education that would enable them to "fight the devil on his own ground"? One solution was the development of the Course of Study. Preachers of the first, second, third, and fourth year would be given a reading list. Each year at annual conference those preachers would be examined on the books they had read. On February 27, 1841 Daniel Carl wrote from Houston County to his colleague in Liberty, John Woolam, and described what he was reading. Fletcher's Appeal, Watson's Wesley, Calvinistic Controversies, Bangs on Episcopacy, and Wesley's Notes. Carl was also studying Smith's Grammer (sic) . Carl recommends these same books to Woolam, but is careful to add, "But do not let me direct your mind from the fountain of Truth your Bible." Methodist layman Martin Clark of Tennessee reported to Littleton Fowler on a recent trip he made to the Congress of the Republic of Texas. Clark's purpose was to organize a Methodist society and Sunday School in the new capital of the Lone Star republic. He efforts met with great success. He was able to report that prominent Texan statesmen, even some who were not Methodist, helped the Methodist cause. The roll of the new society included Attorney General James Webb, Representatives Thomas Jefferson Rusk, James Riley and David Kaufman as well as ex-President Sam Houston. The politicians could not resist the opportunity to show off their oratorical prowess. Clark was so impressed by Rusk's oration that he wrote the following: His concluding sentence deserves to be written in characters of sunshine across the Heavens that the world might read it. "I would rather have it said of me when I have been gathered to the graves of my fathers that I had thrown my influence onto the scale of virtue & had acted as conservative to the morals & happiness of the rising generation than to have that halo of military glory that settles around my head of a Napoleon to his exile & his grave." 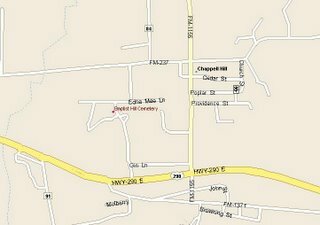 The Spring meeting of the Commission will be at First United Methodist Church in Chappell Hill, Texas. This historic church, in the heartland of the old Republic of Texas (it's near Brenham & Washington on the Brazos), hosted Annual Conference many times in the olden days. As you might imagine, the population has since bypassed Chappell Hill, but the memories remain. If you're attending the meeting, I've attached a map to help you find the church. 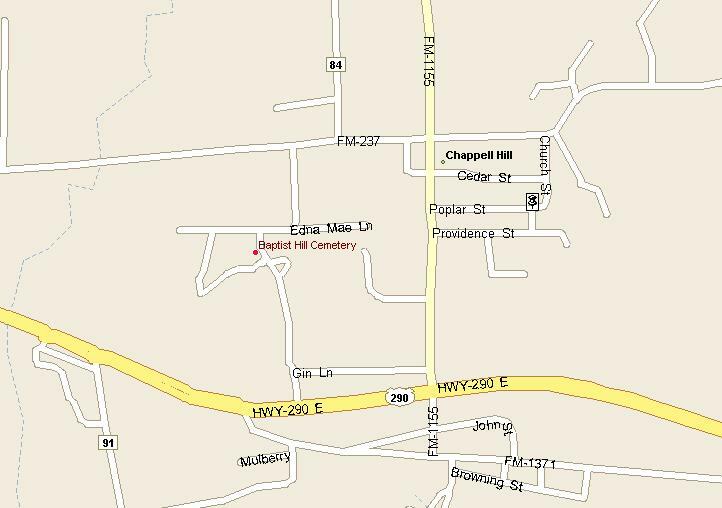 It's at 5195 Church St. in Chappell Hill. First United Methodist Church in Arlington, Texas, founded in 1878, lost their sanctuary to a fire in 1954. Now they are celebrating the 50th anniversary of that "new" sanctuary. After the devastation of the storm of 1900, Galveston slowly rebuilt and assumed its former place as a major Gulf port. The Woman's Home Mission Board of the MECS found ample opportunity for service and witness in that bustling Texas city. While the US Army Corps of Engineers was building the sea wall and raising the island's grade, Deaconesses Elizabeth Taylor and Jeanette Haskin were organizing Wesley House, one they later claimed was the first settlement house to be named "Wesley House." They provided vocational training, music, and basic academic instruction to Galveston children in Sunday School classrooms. That modest program expanded in 1908 as the Woman's Home Mission Board created the Immigrant Home. That facility specialized in serving immigrants who had been denied entry by the government and were were awaiting repatriation. The deaconesses also served unaccompanied child immigrants and young women who had arrived alone in Galveston expecting to find their fiances waiting for them. The Immigrant Home was doing so well that after only six months in operation it expanded its programs by opening the Seaman's Home on February 11, 1909. Methodists wished to provide the sailors in Galveston with a Christian alternative to the saloons and brothels which flourished there. The Seaman's Home boasted a hiring hall, chapel services every Sunday night, and a reading room with Christian literature in German, Spanish, Swedish, Italian, and French. The Seaman's Home also provided stationery and postage stamps so that seamen could stay in touch with their families. The Seaman's Home was in operation only four years. It closed February 1, 1913. In those four years 30,000 seamen registered at the Home. There's a story in the Jacksonville Daily Progress about the recently released history of First United Methodist church in Jacksonville. “The Methodist March” is $25 with a $5 shipping and handling fee for orders to be mailed. For anyone interested in purchasing the book, an order may be mailed to FUMC at 416 South Bonner, Jacksonville, Texas 75766. Inquiries are welcome by phone at 903-586-2494. Texas Methodists established a college even before they organized an annual Conference. Martin Ruter, head of the Methodist Mission to the Republic of Texas, was determined that Texas would have a university. Although Dr. Ruter was mainly self-taught, he had been president of two colleges in the United States. He and his colleague, the Rev. Littleton Fowler, spent much of their first weeks in Texas in Houston lobbying the Congress of the Republic of Texas for a university charter. Mexico's embrace of Roman Catholicism had a left a majority of the Congress suspicious of governmental entanglements with sectarian enterprises. Less than six weeks after Ruter's death in May, 1838, twelve investors decided to take the bull by the horns and begin a town and university in spite of the lack of a charter. They purchased a league of land near present-day LaGrange and hired the Rev. John Wesley Kenney to survey it into city blocks and small farms. They named their town Rutersville and immediately began planning the school that would anchor the town and help them sell their town lots. The founders enacted phohibitions against the sale of alcoholic beverages. By the fall of 1839 plans were far enough along to hire Chauncey Richardson as president of Rutersville College, and on the last Monday of January, 1840, doors opened. President Richardson, his wife Martha, and Charles Thomas were the faculty who greeted sixty-three students. There were three departments, Classical, Preparatory, and Female. Few of the student had prerequisites for anything other than Preparatory. Entrance into the Classical Department required knowledge of algebra through quadratic equations, ancient and modern geography, Latin and Greek grammar and the ability to read Cicero, Virgil, and the Gospel of St. John in the original languages. The doors had been open only a week when news came that the Congress, now meeting in nearby Austin, had granted the charter. It had even granted land to help sustain the school. Rutersville College became a focus of Methodist acitivity in western Texas. Methodist families moved there so their children could attend classes. On Dec. 25, 1840 the Texas Annual Conference was organized there. This first attempt at higher education in Texas lasted only until 1856. The establishment of other universities such as Baylor at Independence and Soule at Chappell Hill made student recruitment more difficult. Even though it closed, its legacy lives on in its successor, Southwestern University.